Injection molding is an important industrial method. It is little bit similar to die casting but the difference is in raw material used. In die casting we use metals which require extremely high temperature for melting but injection molding is mainly done on glasses, elastomers and most commonly thermoplastic and thermosetting polymers but this technique is widely used for fabrication of thermoplastic materials. This process is done by heating of raw material and injecting them into the mold cavity by applying pressure at a specific temperature without any change in their chemical composition. 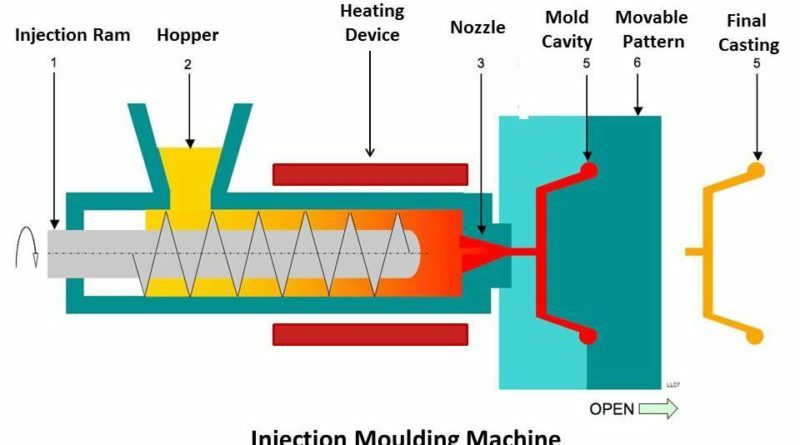 The main parts of the Injection molding machine are material hopper, barrel, an injection ram/ rotating screw type plunger, heating device (heater), movable pattern, ejectors, and a mold inside mold cavity. Generally injection molding machines works in horizontal manner. Injection molding machine consists of a barrel (cylindrical pipe). A hopper is located at one end of the barrel. A hydraulic ram or rotating screw runs by electric motor used of providing force is located inside the barrel. A heating element (heater) is attached to the barrel circumstantially used for melt the molding material comes down from the hopper. On the other side of barrel a mold cavity attached. Mold is located inside the mold cavity and a moveable pattern is used in whole manufacturing. Mold is generally made up of copper, aluminum and tool steels. The life cycle for different material molds are different. This can be selected as per requirement. Working of injection molding similar to extrusion and it works like an injection as name suggest. Molding material/ raw material pour into the hopper by feeding device. 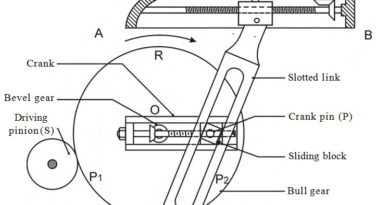 After that molding material goes down under the action of gravity into the cylinder (barrel) as shown in diagram. A circumferential heater which is located on the barrel is used to melt the material. When powder form of molding material goes dawn into the barrel from hopper it starts melting and a hydraulic ram or rotating screw pushes the material forward into the mould by applying some pressure. Molten plastic material is injected into a closed mould attached on the other side of barrel; in this split mold is used. Molding material goes forward continuously by the rotating screw. Pressure applies by the hydraulic system. Injection pressure is generally 100-150 MPa. After injection; pressure is applied for some time or locked at same position with some force. After the whole process is done the parts manufactured is cooled sufficiently. Then mold is open and some ejectors are used for proper removal of the part without damage. After removing the part mold is closed again. This process is very fast and automatically repeated. Here complex shape parts can be easily manufactured. Production capacity of injection molding is 12-16 thousand parts per cycle. Process parameter varies according to condition and requirements. Weight of the parts produced by this process is generally 100 to 500 g.
Cycle time for produce a single part is generally 5 to 60 seconds depends upon the parts manufacture. Heating temperature of molding material is 150-350 degree centigrade. Injection capacity of molding machine is 12,000 to 2.2×〖10〗^6 〖 mm〗^3. Injection pressure is 100-150 MPa. Locking force is 0.1 to 8.0 MN. The main advantage of this process is that complex shapes components having small wall thickness (5-15 mm) can be easily molded and removed from the die without damage. Parts which are made by injection molding have good dimensional tolerance. The major advantage of this technique is that the scrap produced by this is very less as compare to some other processes. Parts made by injection molding process are competing with parts made by investment casting and complex machining parts. This process is having high production rate as compare to other techniques. Initial cost/ setup cost of this process is very high due to design, testing and tooling of the whole equipment. Investment molding is generally limited to some special kind of materials like thermoplastic materials or some polymers only. High tooling cost i.e. the mould used is made by several processes and testing the overall cost of making a single mold is very high. For different parts different kind of molds are required. Injection molding is used for making complex shape parts of various sizes having less wall thickness. Typical parts like cup, containers, toys, plumbing fittings, electrical components, telephones receivers, bottle caps, automotive parts and components. 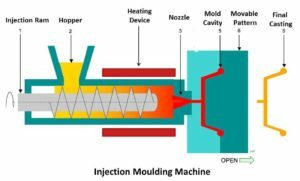 This is all about Injection Molding Process. If you have any query regarding this article, ask by commenting. If you like this article, don’t forget to share it on social networks. Subscribe our website for more informative articles. Thanks for reading it. ← How a Refrigerator Works?